Proven security for your VMware virtual data center. The Trend Micro™ Hybrid Cloud Security solution, powered by XGen™, brings protection and visibility to VMware Cloud on AWS, and removes the complexity and risk of managing security across multiple environments. Comprehensive security for the modern data center. Trend Micro™ Deep Security™, powered by XGen™, provides automated security designed for modern data centers using VMware®. Only Deep Security provides seamless integration with VMware technologies and multilayered protection that can be automated to prevent attacks. And with built-in hybrid cloud security, we’re ready for the cloud whenever you are. Deep Security was built from the ground up to efficiently secure virtualized data centers built on VMware technologies. Full visibility into VMware deployments and automated security help streamline your data center ops while speeding up compliance. Efficiently protect your hybrid cloud deployments from the latest threats, including ransomware, with virtual machine security that works consistently across the virtualized data center and the cloud. Modern data centers need modern security. You need hybrid cloud security that matches the performance and flexibility of today’s virtualized data center — that’s exactly what Deep Security does. Purpose-built to support VMware deployments, Deep Security uses a comprehensive set of policy-enforced security controls to automatically shield VMs from network attacks and vulnerabilities, stop malware and ransomware attacks like WannaCry, and detect unauthorized system changes. Trusted by top organizations around the world. Trend Micro Deep Security protects thousands of VMware customers and millions of VMs around the world. For six years running, IDC has named Trend Micro the market leader in server security. ESG’s economic value study shows how Deep Security can maximize your virtual data center investment. Find the latest information about VMware and modern data center security here. Can’t find the information you’re looking for? Contact us and let us know. 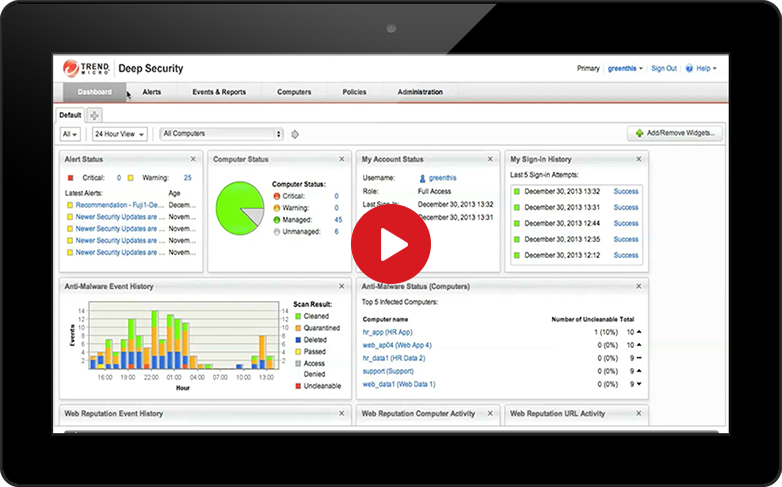 Let’s discuss how Deep Security can meet your virtualization security needs.